From time to time we all suffer from slumps in motivation. Excuses are always easy to come by; it’s too cold, you’re too tired or you don’t have enough time. Many, in fact, never really acquire the willpower needed to accomplish the physical goals they aspire to achieve. Nick runs Lowe Finance, his wife is pregnant with their second child and they have a three year old boy running around – how could he possibly fathom training for an Ironman? Sleep deprivation, fatherhood duties and maintaining a healthy marriage are all relevant reasons not to take on such a big commitment. Over the previous three years, it’s fair to say Nick had been building the conditioning required to complete an Ironman. He had competed in some smaller distance triathlons along with four half Ironmans, so the natural progression into a full Ironman was on the cards. Yet to train for such an event is another kettle of fish, requiring incredible commitment and availability to manage the training load. Without over thinking all the peripheries which could hinder his ability to train, when registrations opened in April 2014, Nick just locked it in . An ultimate action that triggered the can-do attitude he required to cross that finish line on Sunday the 22nd of March 2015. Habits are defined by three key elements: (1) A cue, (2) the routine and (3) the reward. In this instance, the cue was registering for the Ironman. The routine was all the training. The reward was an unbelievable feeling of self-accomplishment. The cue of signing up for the Ironman inadvertently forced Nick to establish a routine that would provide a structure to train for the Ironman. Whilst this may seem easy at first glance, there was a considerable amount of expectation-setting and time management to be organised. Step one – Assess work and family commitments and find the best time slots for training. Nick decided lunchtimes would be the best time for quality runs and swimming, with Saturday mornings being the time for a long ride and Saturday afternoons a long run. Step two – Make some time to sit down with family members, teammates and coaches to discuss your goals. Collaborate on an appropriate framework and training diary to ensure everyone understands your capacity. This will ensure you can optimise your training schedule given you now have a defined path. Step three – Finally, you need to make sacrifices in your training schedule to get the most out of your time. Some Saturday mornings Nick spent three hours on the indoor trainer, as the efficiency of the indoor trainer is far greater than cycling on the road. If you’ve ever ridden on an indoor trainer before, you’ll know a full hour is an impressive effort, let alone three! With roughly eight hours a week to train for an event that takes over ten hours to complete, the indoor trainer became an imperative tool. 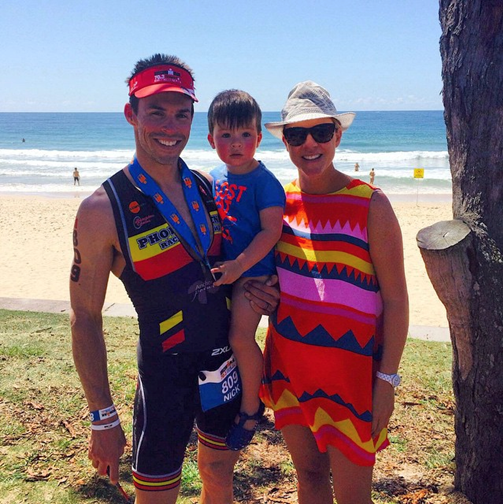 Nick with his wife Fiona and son Ned at Sunshine Coast Ironman 70.3. 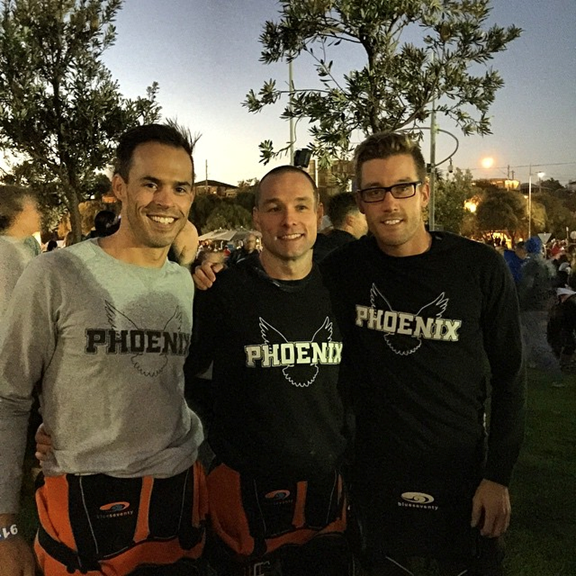 Having his Phoenix teammates by his side helped Nick stay focused and created much needed motivation in the lead up to the event. While Nick was unable to train with them most of the time, having people within his own environment training for the same goals made a huge difference. “At times I wasn’t sure if I could meet the training demands given my personal circumstances”, says Nick. 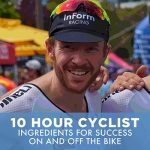 “And while I wasn’t able to train most mornings and afternoons, having them spur me on via emails, phone calls, text messages and social media gave me incredible drive”. Nick with Phoenix Racing Team mates, Stephen Natoli & Sam Madden pre-race at Ironman Melbourne. After completing a solid swim in perfect conditions, a reasonable ride (despite a bee making its way through a gap in his helmet, stinging him on the forehead!) Nick’s run started as expected. However, about twenty kilometers from the finish line cramping started and the mind games began. Self-doubting questions like “why do I do this sport? What am I doing here?” were running through his head. “It’s like you become a different person”, Nick says. Luckily Nick had a great support crew on the sidelines. Having his wife and kids there to support him along with friends such as Cam Hanley, who knew the pain Nick was going through having completed the event himself multiple times, gave Nick incredible drive to get to the finish line. 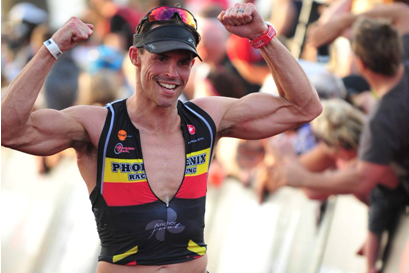 He completed his first Ironman in around ten and a half hours – an impressive effort considering all circumstances. A year after signing up to the 2015 Melbourne Ironman Nick got over the finish line driven by his desire to achieve. By having this desire, Nick locked in the event without question. The cue of signing up for the Ironman created a work ethic to empower him to finish the race despite his many obligations and limited time to train. A great achievement indeed.